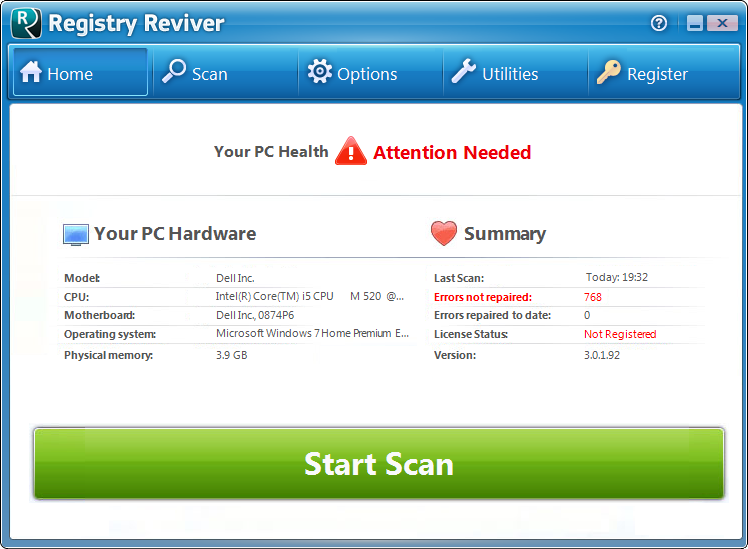 Optimize your computer\\'s performance and reliability today with the Multi Award Winning Registry Reviver. Registry Reviver conducts the most complete Windows registry scan in the world. Run a FREE scan and immediately improve your PC’s performance! Optimize your computer\\'s performance and reliability today with the Multi Award-Winning Registry Reviver. Registry Reviver conducts the most comprehensive and complete Windows registry scan in the world to identify problems and immediately fix them to quickly and easily restore optimum performance to your PC. Run a FREE scan today and immediately improve the performance and reliability of your PC! * Increases your computer\\'s performance - You will see immediate increases in your PC\\'s performance and stability. * Stops PC crashes and errors - Your PC will boot up faster, be more stable, and experience less crashes and conflicts. * Quick diagnosis - Find the problems for your computer quickly. * One click fix - Take the frustration out of a slow performing PC, and optimize your PC with one simple mouse click! * Intuitive Interface - Intuitive and simple to use design makes it easy to know what to do every step of the way. * Free 24/7 technical support - Should you need assistance you can contact our friendly support any time. * 30 day money back guarantee - For absolute peace of mind. Registry Reviver uses the most advanced technologies available to analyze PC errors and speed up your slow PC. Registry Reviver detects and removes all unused entries in your PC registry from failed software, driver installations, faulty installations and uninstallations, and optimizes your Windows startup. Optimize your computer\'s performance and reliability today with the Multi Award Winning Registry Reviver. Registry Reviver conducts the most complete Windows registry scan in the world. Run a FREE scan and immediately improve your PC’s performance! System-Care keeps your PC smooth, clean and error free. It boosts up the performance and overall speed of your Computer System instantly. It comprises of a registry cleaner, start-up manager,add-on remover and a very robust adware / malware cleaner. The Reimage program scans, diagnoses, then repairs your damaged PC with powerful technology that not only fixes your Windows Operating System - it reverses the damage already done with a full database of replacement files.